Hotel El Velero – The Beach is Our Backyard! Welcome to Hotel El Velero, a Mediterranean-Style, Boutique Beach Hotel just paces from the Pacific blue waters of Costa Rica’s pristine Playa Hermosa. Hear the waves and breathe the clean, salty air as you relax in our seaside tropical gardens! Our incredible location, friendly staff, and moderate prices make Hotel El Velero an ideal place to escape the stress of everyday life or enjoy a romantic vacation. For your convenience during your stay, we offer free high-speed Wi-Fi on the premises. Browse around learn more about Playa Hermosa, the Province of Guanacaste, Costa Rica, and the great activities and attractions that make this such a great destination! Situated in Costa Rica’s most popular region, Hotel El Velero is right on the beautiful Playa Hermosa in Guanascaste. 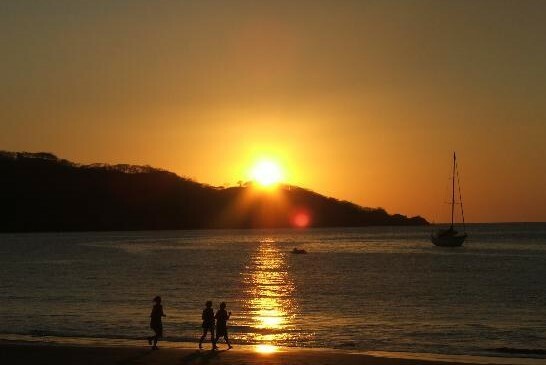 Playa Hermosa, which in Spanish means “beautiful beach”, has been Awarded the “Blue Flag”. Under the Blue Flag Ecology Program, Costa Rican beaches are evaluated on a strict criterion.Only beaches with a 90% score succeed in acquiring a distinction and receiving the Blue Flag. Beaches awarded the Blue Flag are then monitored on monthly basis for sustained maintenance. Hotel El Velero is just a 20-minute drive from Liberia International Airport (LIR). Airlines into Liberia include: United, American, Jet Blue, US Airways, WestJet, Delta, Alaska and Southwest Airlines. Contact us with any questions. See Accommodations for photos of our rooms, and browse our Gallery. Hope to see you in paradise soon!